Blood: Water Mission - the organization that began as the vision of Jars of Clay’s Dan Haseltine to impact Africa with safe water—had reason to celebrate (May 10) in Nashville. The concert staging of the “Well:Done Celebration” was held in honor of the successful completion of the ‘1000 Wells Project’ now producing water in communities all over Africa through the work of Blood:Water Mission. The event held at the historic Ryman Auditorium raised over $100,000. Jars of Clay's Dan Haseltine (third from left) joins in the 'Well: Done Celebration' with (left to right) Rich Hoops, Chairman of the Board of Blood: Water Mission; BWM Director Jena Nardella; (TN) Governor & Mrs. Bill Haslam; Mike Hamilton, Althletic Director at the University of Tennessee and BWM Board member. Jars of Clay with friends and fellow artists from 'Well: Done Celebration' in Nashville. 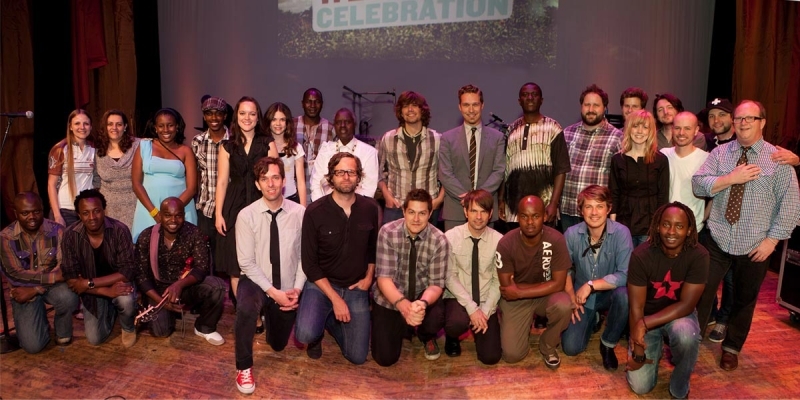 Included in photo are: HANSON, Eric Wainaina and band, Brandon Heath, Charlie Peacock, Derek Webb, Sandra McCracken, and Blood: Water Mission Director, Jena Nardella.